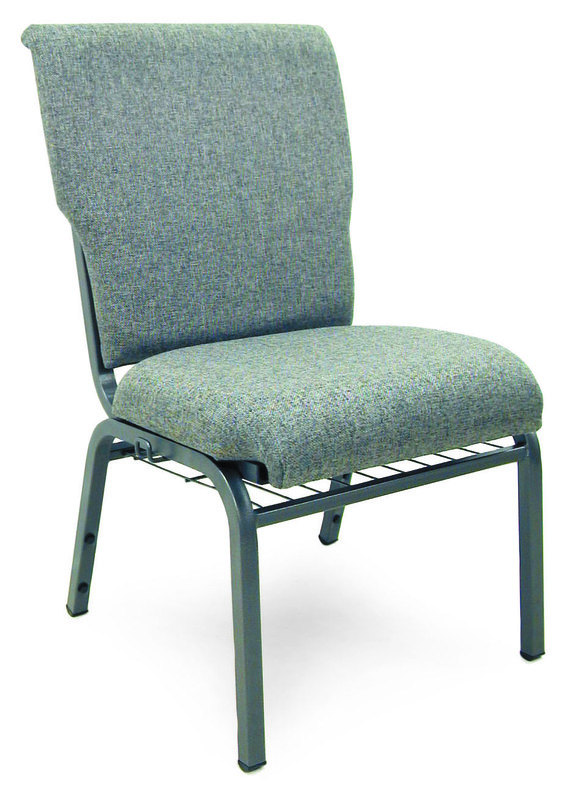 The McCourt Auditorium chair is perfect for schools, churches and waiting rooms. Use it in any area where comfortable seating is desired. This chair is constructed for maximum strength and durability - suitable for bariatric use. These chairs stand the test of time. The fabric is color-fast and stain/odor resistant, and the cushion provides great lumbar support. The chair also includes ganging clips for seamless bench- or pew-like seating and a rear access book rack, improving its functionality tremendously. Our Auditorium Chair will make a great addition to any assembly hall, and it is a popular choice for these types of venues. You have probably seen them somewhere before! These chairs are also stacking chairs, so you can clear the room if needed. Call McCourt Manufacturing today at 479-783-2593 to order your Auditorium Chairs today! Standard features include ganging clips for seamless bench-like seating and rear access book rack. Constructed of 18 gauge steel square tubing. Legs, back and carriage are 1” square mandrel bent tubing. Braces are 3/4” square tubes. Each 6 piece frame member is fillet welded in at least 2 places each end. Ganging clips of 1/4” gauge wire provides easy chair to chair attachment. Bariatric chairs cannot have a bookrack. Seat and back platforms are 3/8” hardwood plywood to which upholstery is stapled. Platforms are fastened to frame with #10 screws, 4 on seat and 4 on back. Back platform is tapered at the waist to allow stacking without upholstery wear. Upholstery is a backed, heavy-hand Polyolefin fiber fully rolled and stapled on padded seat perimeter for durability. Polyolefin fabric is strong, color fast and resistant to stains and odors. Black polyester dust cover under seat perimeter is stapled on +/- 5/8” centers before frame attachment. Seat padding is comprised of 2 3/4” virgin polyurethane base pad with a foam density of 1.6 lb/cf. Back padding is 1 ½” virgin polyurethane foam sculpted with 1 ¼” lumbar. Back cover is unpadded matching fabric. Glides are injection molded, quality wrap-around style polyethylene glides feature half circle profile for antirocking performance. Eight stacking buttons are push barb style injection molded polyolefin to allow stacking up to 8 high with no marring of the adjacent frames. Chair weighs 18.6 pounds and measures overall 21.5” w x 24.5” D x 34.5” H.
Seat is 20” W x 17” D x 3” H. Book rack opening is 2.5" at back and 1.5" at front. Each chair has 6 1/8” stack pitch and can be safelystacked 8 high for storage. Eight chairs ship wrapped in cardboard and strapped to a skid which is maneuverable with a two wheel hand cart. Stack measures 21.5” w x 29” d x 78” h.
Standard upholstery colors are Charcoal, Navy Blue, Forest Green, Burgundy, Grape and Beige. Custom fabrics and vinyl available. Frame is silvervein powder coat finish for extreme commercial application. Custom fabrics and Extra Wide 22" Seat available. Contact McCourt for pricing and lead time. Full 3 year warranty against upholstery seam failures and frame damage due to materials and workmanship under normal use. Fabric tears and stains not covered. McCourt Manufacturing will repair or replace (at our option) at no charge; customer assumes all freight charges.